Christmas is just around the corner! Our brand new christmas tree is going to give you a warm and nice holiday. 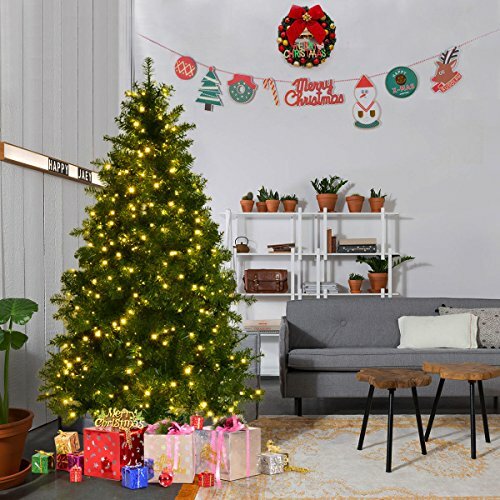 Having this artificial PVC christmas tree, you will no longer need to spend plenty of time to spread your tree, because all the branches will drop to the designed place to make the tree archive the best effect. 821 tips and 560 warm white led lights make this tree looks warm and thick. The thick blades of our christmas tree are made from eco-friendly PVC material, which makes the tree is absolutely safe even to babies and also add anti-crush capacity to the tree. The tree trunk and stand are both made of high quality steel, that are different from other cheap made trees who use plastic. Come on! Let us give you a easy and warm holiday! 【Eco-friendly Material】821pcs tips christmas tree are made from high quality PVC material, not only makes the tree looks more real and more full, but also add the anti-crush capacity to the tree. 【Easy to Set Up】Come in 4-pieces for quick and easy set-up makes row-by-row assembly and fluffing easier, more effective and fun. 【Pre-lit 560 Led Lights】Our christmas tree is pre-lit with 560 low voltage LED lights. These led lights are energy-efficient and long lasting. Pre-lit design saves your time to set up electric lines, you just need to put your favourite decorations on the tree. 【Humanized Design】The natural unfinished feature allows you to be creative, the christmas tree can be decorated match your style. 【Metal Stand】Goplus christmas tree uses metal stand instead of cheap plastic stand, and add plastic cover on the end of the stand. Sturdy foldable steel base provides stability to keep your tree standing tall and prevent breakage.